Green buildings are becoming cornerstones of construction activities across the globe. These buildings are especially popular in developed regions, where environmental conscious consumer, industries, and stringent regulations are paving way for a greener future. Additionally, green buildings are becoming more attractive for their several economic benefits as well. Green buildings consume less energy and are easier to maintain over the long duration. The smart glass market plays an important role in these economic benefits, by reducing cooling, heating, and lighting costs. The smart glass market offerings also block close to 100% UV light and protects residents from harmful exposure to UV radiation. Governments around the world are taking initiatives to promote green development which is driving growth of the smart glass market. The high costs associated with the technology is expected to pose a challenge to its growth during 2016-2024. However, the global smart glass market is expected to reach US$7.04 by 2024 end, up from US$2.10 bn in 2015. The global smart glass market is expected to grow at a robust CAGR of 14.50% during 2016-2024. The global smart glass market is in its nascent stages. The established market players are exploring various new opportunities to expand their offerings and applications. The transport sector accounted for over 50% of its total market share in 2015. Hence, the transport sector is emerging as a key sector for the global smart glass market. The smart glass market offerings are quite popular in premium cars. The auto thermal cooling and heating according to external weather changes is extremely important and increases fuel efficiency with less pressure of fuel management on car engines. Hence, smart glass installations on sun roofs, side and rear windows, sun visors are in high demand in the global smart glass market. Additionally, smart glass market has also started catering to aviation sector due to growing demand for digitalization of baggage systems. The growing demand in aviation, and rising demand for automobiles worldwide is expected to drive the global smart glass market during 2016-2024. The global smart glass market is classified into five main regions including North America, Europe, Asia Pacific, Latin America, Middle East & Africa. The smart glass market in North America region held the leading share of the global glass market in 2015. It accounted for 30% of the total market share. The region is expected to dominate the global glass market during 2016-2024 as well due to rising focus on renewable and green energy. Rising renewable energy sources like solar energy are expected to drive growth of the global smart glass market in the near future. Similarly, Asia Pacific regional market is witnessing a significant growth in the global smart glass market. 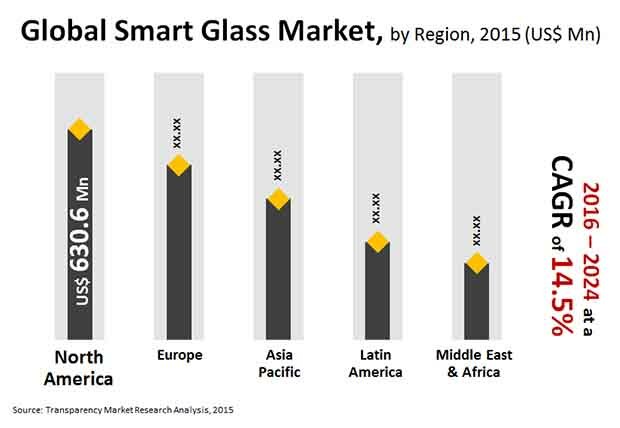 The region promises lucrative opportunities during the forecast period as growing expansion of infrastructure, rising disposable income in Asian countries are expected to drive growth in the smart glass market. Rising demand for smart technologies, solar energy, renewable sources, and growing automobile sales in the region are further expected to fuel demand in the region. The global smart glass market is a consolidated and competitive landscape. A few key companies in the global smart glass market are Smartglass International Ltd., DuPont, Research Frontiers, Polytronix Inc., and iGlass among others. The report provides in-depth analysis and forecast of the smart glass market on the global as well as regional level. The report includes forecast for the period from 2016 to 2024 in terms of volume (Mn Square Meters) and revenue (US$ Mn). Quantitative data has been derived through extensive secondary research of the global smart glass market. Secondary sources typically include company websites, relevant magazines, government documents, and press releases. The top-down approach has been adopted to derive the regional numbers from global revenue and volume figures. Furthermore, the bottom-up approach has been employed to derive data for various technology type and end-use sectors based on demand for smart glass in each geographical segment. A combination of top-down and bottom-up approaches helps in validation of the quantitative data of the market. The data was further validated with the help of primary research with industry experts to ensure accuracy of derived numbers. Detailed analysis of various factors driving the global smart glass market has been included for astute decision making. Impact of these drivers during the forecast period has been included with data to substantiate research findings. Furthermore, factors restraining market growth have been included for better understanding of the market. Impact of these restraints has been analyzed over the forecast period. The report also comprises various opportunities available for market growth over the next eight years. Opportunities entail untapped or recently explored factors that are anticipated to drive the smart glass market during the forecast period. The report includes value chain analysis to help understand the industry thoroughly. Value chain analysis comprises detailed evaluation of the roles of various entities involved in the smart glass industry, from raw material suppliers to end-users. Various processes employed in the manufacture of smart glass have been included in the value chain analysis. Porter’s Five Forces model has been included to determine the degree of competition in the market during the forecast period. Furthermore, market attractiveness analysis has been conducted to analyze application segments that are expected to be lucrative during the forecast period. This is based on various factors such as market size, growth rate, profitability, raw material procurement, and competition in each application segment. Based on technology type, the smart glass market has been segmented into electrochromic, liquid crystal, photochromic, thermochromic, and suspended particle devices. In terms of region, the market has been segmented into North America, Europe, Asia Pacific, Latin America, and Middle East & Africa. Demand for smart glass in each technology type has been analyzed and forecast for a period of eight years. The report comprises detailed analysis of all the segments in the regional and global markets and forecast based on current and future trends in the industry in terms of volume (Mn Square Meters) and revenue (US$ Mn). It also comprises profiles of leading companies in the smart glass market. These include Asahi Glass Corporation, DuPont, Research Frontiers, Saint-Gobain Group, and Smartglass International Limited. Various attributes of these companies such as company overview, business strategies, and recent developments form the core of the company profiles section.